Few Americans were aware of the implications of the "corporate-personhood" creating Citizens United decision until it became enshrined into case law by a similarly activist federal court system, granting unprecedented power to the world's largest corporations to hijack democracy in the name of "free speech." Progressive Source, my small public interest communications company, has created the animated two minute video below, as well as this Change.org petition, to build public awareness of what I call the Monsanto Doctrine--before it is too late to stop it. 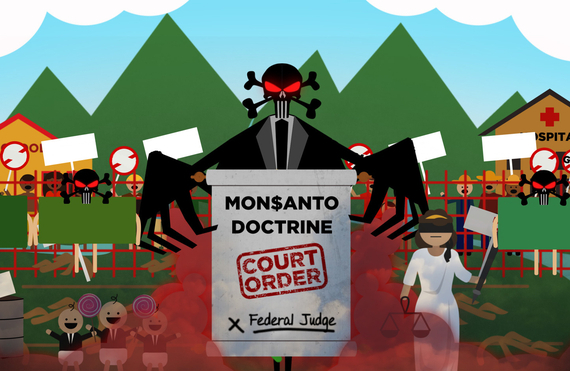 Ronnie Cummins, the outspoken founder of the Organic Consumers Association, believes the Monsanto Doctrine is an appropriate legal characterization of what he calls "genetically modified democracy." Cummins observes that "Hawaii is a dumping ground for GMO testing and the dumping of untested chemicals that always accompanies them." Cummins warns that the federal court's interventions in the Hawaii cases as "part of a growing trend of federal preemption of state rights in which the judicial branch, which is supposed to act to balance federal, state and local power, has become part of the establishment." Simply put, the Monsanto Doctrine is the right of agrochemical corporations to spray unlimited quantities of industrial poisons regardless of any local law passed to protect human or environmental safety. If it is upheld by the federal Appeals Court, then local governments around the country will be rendered powerless to protect its citizens' basic civil right to health and safety. Zen Honeycutt, a mother of three whose child's reactions to toxic food caused her to found the grassroots Mom's Across America organization, says that the District Court decisions show, "tragic disregard" for the citizens of Hawaii. She believes that, "Health and environmental issues must always be governable by the local counties because they are the ones experiencing the health and financial burden of pollution. We expect our federal government to support local democracy, not destroy it. The Federal District Court's decisions in Hawaii were a shameful mark on the history of our society and we look forward to a correction of justice." The Hawaii District Court decisions to be reviewed on June 15 blocked important, prudent public safety laws passed in Maui, Kauai and Hawaii counties from taking effect. They were based upon the ominous legal finding that the very power of the counties to make these laws was supposedly "preempted" by the superior power of either the State or Federal Departments of Agriculture, despite the facts that neither agency has ever tested the safety of the pesticides being used in Hawaii. The Monsanto Doctrine means that the federal agencies that were established by Congress to protect public health and environmental safety have been reinvented as legal shields to protect the world's most toxic agrochemical companies from the authority of local government to provide that very protection to its citizens. These rulings are based upon the finding that Monsanto, Syngenta, Dow Chemical, BASF, Dupont and Bayer, multinational corporations which sell tens of billions of dollars of pesticides each year, would, according to the federal court, "suffer irreparable harm" from curtailing their operations to comply with local laws. This Monsanto Doctrine of pre-emption convinced the Federal District to invalidate common sense safety laws passed by County legislators in Kauai and Hawaii County, as well as a GMO Moratorium ballot initiative passed by the citizens of Maui during the November 2014 election. Maui's ballot initiative called for a moratorium on the production of GMO seed crops until they had been independently tested and proven safe. Although such tests are something that the federal EPA, DOA, and FDA have all failed to ever do, the federal court took the historic step of prohibiting Maui's government from certifying the vote or implementing its new moratorium law. Gary Hooser, a Kauai County Council Member who spearheaded his County's legislation, interviewed below, describes his government's uphill battle to provide the County's citizen's with their "core basic human rights: the right to free speech, free expression, clean air, clean water and self-determination by our community." Kaua'i Council Member Gary Hooser: How Basic Civil Rights to Health and Safety Were Crushed by Syngenta from Progressive Source on Vimeo. Hooser created Kauai's Bill 2491 a few years ago in response to concerns about illnesses in the community from the more than 300 annual field tests conducted on the island by Syngenta, Dow, Dupont, Pioneer and BASF. "Doctors who had delivered babies were saying they believed we had 10 times the national rate of certain heart defects on the West Side of Kauai," he explained. "Kids were getting sick in the schools, sea urchins dying in the ocean. So we drafted a bill that required disclosure (of which pesticides were used) and modest buffer zones of 500 feet between pesticide spraying and schools, hospitals and homes. And rather than comply with our law that we passed democratically in our community, they took us to court. They are suing us today for the right to spray poisons next to schools and not tell us about it." The Ninth circuit Appellate decision to uphold or overturn the Federal District Court in Hawaii may have global implications. That's because a Monsanto Doctrine victory could be applied by pesticide multinationals to a secretly negotiated international trade agreements like NAFTA, the TPP and TPIP. Such challenges to common sense regulation by the agrochemical giants would be decided by secret industry-selected tribunals, who would have unappealable authority to impose rigged GMO and pesticide "safety" findings upon entire nations. With zero transparency, these tribunals could levy fines of billions of dollars in imaginary "lost income" for toxic polluters whose corporate rights are infringed upon by common sense public safety regulations. Kauai's Gary Hooser, whose County will is a plaintiff in the June 15 oral arguments that activists have dubbed, "Environmental Justice Day," believes that justice will prevail in the Ninth Circuit Appellate Court, which has a reputation for upholding civil rights. "There is no state law and are no court cases before this that keeps us from passing laws to protect ourselves. The state constitution says that the State and all its political subdivisions, which means counties, shall protect the environment and health and water. So as a Council Member It's my job to look out for the people in my community. And the Federal judge is saying I can't do my job? I have a hard time with that." On June 12, a few days before the trial, hundreds of native Hawaiians attended an "Aina Protectors United" rally, then marched through the rotunda of the Hawaii State Capitol, blowing conch shells and demanding justice. 'Āina Protectors United March Through the Rotunda from Progressive Source on Vimeo. "These companies are trampling over our basic civil rights," said Kauai's Gary Hooser. "And we refuse to give them up. We're entitled to them. And we're going to fight them every step of the way to keep them."